BETHLEHEM — The public library will open its new self-service studio, which facilitates video making, podcast recording, file conversions and helpful software applications to empower residents to become skilled editors, with a ribbon-cutting event on Friday, March 22 at 11 a.m.
To be open seven days a week, the ADA-compliant studio space, known officially as Studio Makerspace, will be accessible to anyone with an Upper Hudson Library card who can schedule a three-hour session at a time through the library’s online calendar. It will be available for anyone who can use it to create anything like YouTube videos, filmed interviews, broadcast sessions or audio podcasts. The One Button desktop (L-R): the Mac desktop, video camera, USB port, and the silver begin/end recording button. The studio includes a Mac-powered desktop called the One Button studio with a built-in video-recording camera, a namesake silver button to begin and end recording, and a central USB port where the user can insert their flash drive which would contain the recorded raw footage. Upon pressing the silver button, the user is given an eight-second countdown where they would have apt time to sit at the studio’s talk-show-like setting across from the desktop, which comprises of two seats, a center table, and blue background curtains — this is where the user can film themselves as they talk. Once the user is done filming, simply go to press the silver button again to end recording, and the inserted flash drive would have saved the raw footage as an MP4 file once processing is complete. The library also has 10 laptops — available to be checked out with a library card at the information desk — equipped with Adobe Premiere Elements which can be used to edit and polish the recorded video, including the abilities to convert the files, add subtitles, zoom in/out of the video, and visual effects. In addition, video cameras are available for users to borrow for two weeks if they would like to film outside the library for their videos. 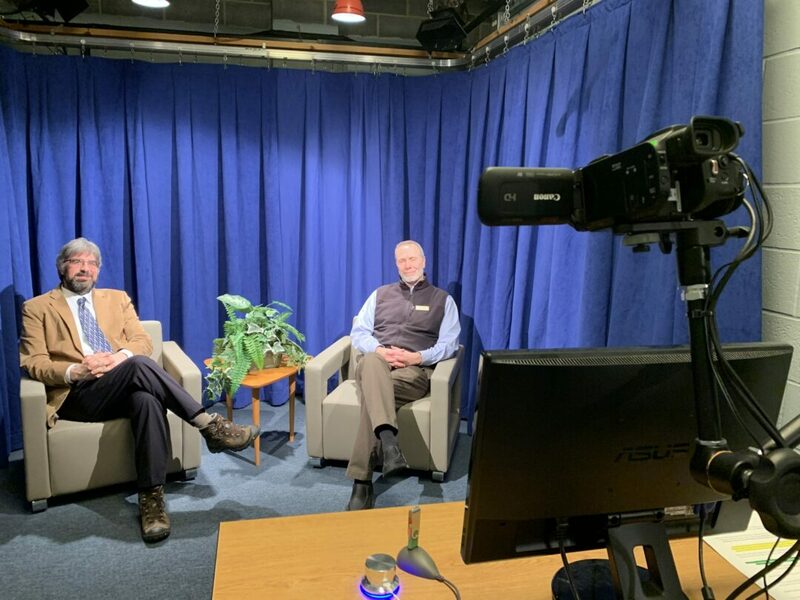 There has been a studio space at the Bethlehem Public Library since 1981 and this upcoming one was first constructed in summer 2018, intending to provide more space, opportunities and self-serving applications for users to enjoy.